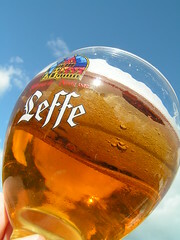 Leffe Blonde - perfect sunny day beer. Thanks to David Wilmot on Flickr for the photo. My Own Porch – It’s cheap, the food is good and the beer is better. We’ve got a perfect little table outside on our porch that still allows me a view of the TV to catch a game. Last night, I enjoyed a tall boy of Old Style that a friend had sent me from Chicago while watching the Cubs open up with win in Houston. Doesn’t get much better than watching the Cubs win their first game of the season while sitting in the sun on your porch in April. I’ll usually be drinking much better beer on my porch, but Old Style goes hand-in-hand with the Cubs. You understand if you’re from Chicago. Collins Pub – They only have four tables, but they are on the west side of the building where you catch all the sun. Jeanne and I popped down there on Sunday after a trip up into the Smith Tower, but all four tables were taken. It was a nice consolation to sit at a table right inside and soak up the sun through the window, though. Beveridge Place Pub – I’ve never sat outside here, but I definitely plan to. Since they moved into their new building last year, they have several tables on an outside patio area that will be the perfect fix. Brouwer’s Café – Brouwer’s has a good sized patio that is usually pretty packed during the summer months. The War Room – OK, they don’t have great beer. But, they have a great rooftop bar that opens up during the summer. I’m not 100% sure if it would even be open yet on a week like this. It’s not my type of club/bar, other than the rooftop deck. Linda’s Tavern – Large back patio with lots of room. There are always some pretty solid beers on tap as well (New Belgium 1554 plus several local crafts last time I was there). The late happy hour from 7pm to 9pm is perfect in June/July when the sun is out until 10pm. Gets crowded later in the night. Big Al Brewing – Once again, I’ve never hung out on their outside patio, but I definitely plan to. They have lots of room out there and their patio gives you the perfect reason to stop by and see what’s pouring in the tap room. Uber Tavern – They’ve got a few bar stools and a railing with ledge outside their front door. As this is covered and on the east side of the building, it doesn’t get much sun…but it’s still a nice place to sit/stand outside and enjoy any of their great beers. What favorite outside spots of yours am I missing? Seattle could definitely use more places with outside seating in general. That’s something that Chicago (where I moved from 4 years ago) has Seattle beat for hands down. I miss Sheffield’s! As for our friendly neighbors down south in Portland, I’ve really enjoyed hanging out outside at a couple of the Lucky Lab’s , as well as at Amnesia Brewing. From Chicago and having lived in DC, maybe the east coast mecca of outdoor street drinking, I have to weigh in here. Seattle has a serious shortage of good outdoor seating. I do think the Nickerson, with a strong beer selection of late (Hop Henge, Obsidian on nitro, Black Cat Porter), is a good one. The Attic in Madison Valley has a good outdoor patio and always some good beers on tap (Diamond Knot, Boundary Bay) and sometimes some serious sleepers (lots of Rogue and SN). If you’re traveling to Portland, I’d highly recommend the Old Lompoc’s patio–maybe one of the best in town. Likewise, Goose Hollow has an amazing patio and outstanding ruebens, although they don’t have an outrageous selection of beer. But the patio is one of the best to sit in the warm air and people watch. Teddy’s and the Roanoke Tavern for decent beer and ping pong out in the patio! The Fiddler’s Inn in Wedgwood has a large outdoor patio/garden with both picnic tables and comfortable chairs. The perfect place to sip an IPA while soaking up the sun. It doesn’t have the best beer selection but there are few places better the the back deck of the Eastlake Bar & Grill on a sunny day. They also have a few tables on the roof. The back deck at King’s Hardware in Ballard isn’t bad either. The Dog & Pony Alehouse in Renton has a very large outdoor patio area. Incredible beer selection, great food, and occasional outdoor movies.